Allow me to re-introduce myself… – A Nigerian – Canadian Renaissance Woman. Here is my obligatory 1st blog post (though, it’s actually my third) to share a little about myself and explain why I am even doing this blogging thing at all. I was born in Lagos, Nigeria a few decades ago. I left at 15 to pursue post-secondary education. I am an avid traveler and learner even consider myself to be a bibliophile. After my A-levels and having resided in the UK for 3 years, I decided to get my University degree in Canada. 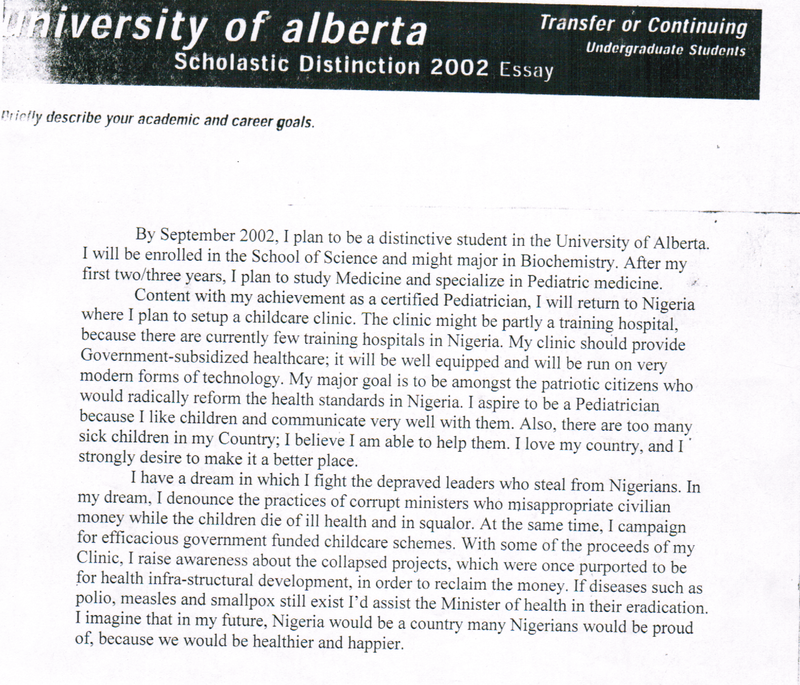 I enrolled at the University of Alberta in 2004, with dreams of becoming a Physician (Yes, I was one of those wanna-be-doctors-now-Pharmacists). I still think my letter of intent to the UofA is the cutest most naïve letter ever. See below. Upon arriving in Canada, I was rudely awakened to the fact that international students are not accepted into most Faculties of Medicine in Canada. However, I found an opportunity to indulge my love for patient care as well as public health interests in pharmacy practice, so I decided to pursue that as a career. My friends, I think, will describe me as an odd mix of the arts and sciences as I actively pursue several dissimilar interests. As a pharmacist, I am able to indulge my public health interests in actively facilitating tobacco reduction programs in collaboration with Alberta Health Services’ Tobacco Reduction Program; collaborating with nutritionists for weight management programs at my store; and contributing to relief and aid for those affected by HIV & AIDS through a program I initiated as a student. As an artist, I paint, draw, collect art, and fundraise with art…as well as design and create clothing occasionally. Somewhere in between, I make time to be a Rotarian, to be the president of the Ribbon Rouge Foundation, and to be the Associate owner of my Shoppers Drug Mart location. I am passionate about supporting immigrants by being a mentor and teacher at Bredin Centre for Learning and being a preceptor for the Faculty of Pharmacy and Pharmaceutical Sciences at the University of Alberta. By now, you might have gathered a few hints such as the facts that … I use ellipses far too liberally… I’m still very much a child at heart; as such, my posts will continue to take on my informal tone and self-deprecating humor, which I hope you’ll grow to enjoy. This blog is dedicated to my various travels, musings, experiences, opinions, hobbies, careers and various other such things that I might find fascinating in the future. I look forward to connecting with you. Feel free to comment frankly always.